They are just what they say they are, beans that are black. They are commonly referred to as turtle beans, probably in reference to their shiny, dark, shell-like appearance. Along with a rich smoky flavor that has been compared to mushrooms, black beans have a velvety texture, yet hold their shape well during cooking. Choosing: Just as with any other food that you may purchase in the bulk section, make sure that the bins containing the black beans are covered and that the store has a good product turnover to ensure the beans' maximal freshness. Whether purchasing black beans in bulk or in packaged containers, make sure that there is no evidence of moisture or insect damage and that they are whole and not cracked. 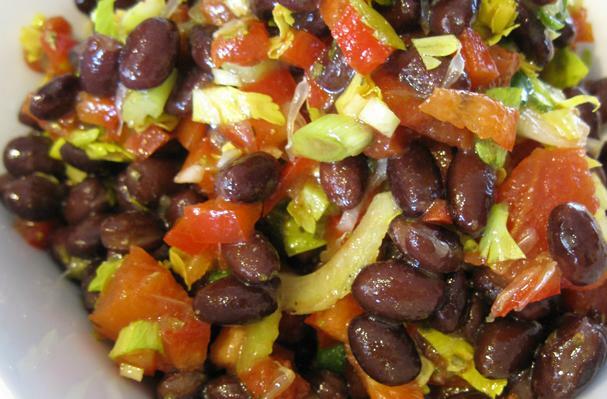 Buying: Dried black beans are generally available in prepackaged containers as well as bulk bins. Canned black beans can be found in most markets. Unlike canned vegetables, which have lost much of their nutritional value, there is little difference in the nutritional value of canned black beans and those you cook yourself. Use as a side dish for almost anything. Puree cooked beans and use to make a flourless and protein-filled brownie batter. Mix with cooked qunioa and salsa for an easy Mexican dish packed with protein. Cleaning: Before washing black beans, spread them out on a light colored plate or cooking surface to check for, and remove, small stones, debris or damaged beans. After this process, place the beans in a strainer, rinsing them thoroughly under cool running water. Canning lowers vegetables' nutritional value since they are best lightly cooked for a short period of time, while their canning process requires a long cooking time at high temperatures. On the other hand, beans require a long time to cook whether they are canned or you cook them yourself. Therefore, if enjoying canned beans is more convenient for you, by all means go ahead and enjoy them. We would suggest looking for those that do not contain extra salt or additives. Store dried black beans in an airtight container in a cool, dry and dark place where they will keep up to 12 months. If you purchase black beans at different times, store them separately since they may feature varying stages of dryness and therefore will require different cooking times. As beans are a very inexpensive form of good protein, they have become popular in many cultures throughout the world. Black beans are an important staple in the cuisines of Mexico, Brazil, Cuba, Guatemala and the Dominican Republic. Today, the largest commercial producers of dried common beans are India, China, Indonesia, Brazil and the United States. History: Black beans and other beans such as pinto beans, navy beans and kidney beans are all known scientifically as Phaselous vulgaris. (This scientific name refers to the genus and species of the plant; navy, kidney, pinto, etc. are different varieties of beans, all found within the species vulgaris). These varieties are all referred to as "common beans," probably owing to the fact that they all derived from a common bean ancestor that originated in Peru.